First Liberty’s Director of Community Relations, Lathan Watts discusses how atheist opponents have distorted Jefferson’s legacy on religious freedom. The original version of this article was published in The Daily Signal on April 12, 2018. April 13 marks the 275th anniversary of Thomas Jefferson’s birthday. A renaissance man with a long and accomplished legacy, Jefferson played a major role in the founding of the United States of America—and establishing its strong protections for religious freedom for all. There can be no better way to celebrate one of America’s greatest statesmen than by reclaiming his legacy of religious liberty and living as boldly as he did in freedom’s defense. It is sadly ironic that a few select words of Jefferson—the “wall of separation between church and state”—have been abused and distorted today by those seeking to dismantle the foundations of our republic. Those words appeared in Jefferson’s now infamous letter to the Danbury Baptists, a religious group in Connecticut concerned with their state government’s weak religious liberty protections. Two county commissioners—one in Jackson County, Michigan, the other in Rowan County, North Carolina—regularly open their sessions with an invocation led by one of the commissioners. In 2013, an individual activist and the ACLU respectively sued the commissioners for supposedly violating the separation of church and state. Would Jefferson agree with those lawsuits? No. As president, Jefferson not only signed bills that appropriated financial support for chaplains in Congress and the military, but he himself attended church services held on the floor of the House of Representatives. While president, Jefferson also served as the chairman of the school board for the District of Columbia, where he authored the first plan of education adopted by the city. His plan used the Bible and Isaac Watts’ hymnal as the principle books to teach reading. Oscar Rodriguez is a decorated Air Force veteran. While giving a patriotic flag folding speech at a retirement ceremony for fellow airman Chuck Roberson, uniformed airmen assaulted and physically removed Rodriguez from the room because he dared mention the word “God” in his speech. What was Jefferson’s approach to the role of religion in the military? 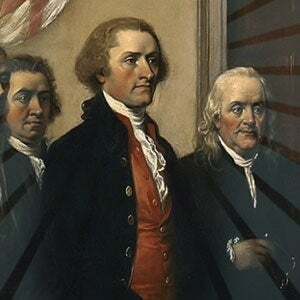 In essence, America’s “birth certificate,” as penned by Jefferson, declared that God existed and that his existence is the basis for all personal, political, and economic rights. Those who seek to hijack the phrase “separation of church and state” to impose secular humanism on our political life can only do so by willfully turning a blind eye to the volumes of Jefferson’s other writings, as well as his own actions as president. Those actions speak louder than any words. But even apart from abusing the phrase “separation of church and state,” the left will undoubtedly continue to target people of faith by seeking to undermine their rights of conscience and free exercise of religion. Those who courageously stand against oppression can do so secure in the knowledge that the author of the Declaration of Independence—and more importantly, the Author of our liberty itself—are not neutral in the contest. News and Commentary are brought to you by First Liberty’s team of writers and legal experts.